One of the charms of Siren 2 is its carefully-made archive items. A total of 100 appear in the game, and by putting together the information hidden in each one you can learn the story that is not directly told during the game, just like in the first Siren. It could also be called one of the things that best represents the game's concept of not simply beating the game, but also enjoying solving its story. 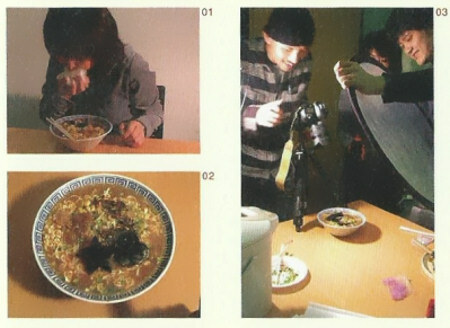 01 & 02 - The staff actually taste-testing archive [No.014] Turtle Jelly Ramen. They didn't just make some ramen that looked similar, they actually made and tried it, which is quite impressive dedication. By looking as Ms Sato as she tries some, it appears to have quite a taste. 03 - Taking photos for the archive. 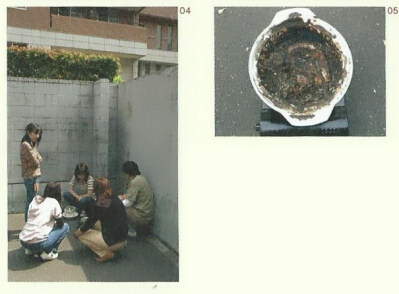 At this point they seemed to have assumed them to be in a bowl rather than cup noodles. The creation of the archive items is actually worthy of special mention for its uniqueness, even compared to the rest of development on Siren 2. The main method used to create them was gathering all kinds of genuine materials and cutting and pasting them together. Unlike standard game development, which involve sitting in front of a screen, tapping away at a keyboard and clicking a mouse, their creation was detailed and handmade. However, since all of the members of the development team pay so much attention to everything, the resulting archive items are created from start to finish, not including just the information you can view in archive mode in-game, but also the parts that the player can't see - their level of completion was even astonishing to the prop team that worked on the live-action film. This led several items created for the game to appear in scenes in the film itself. 04 & 05 - Creating archive [No.058] Yami Nabe. Give or take some, it is more or less the exact thing that appears in the game. Siren 2 also introduces the use of audio and video to give some of the items a sense of interactivity, a new experiment; most of the people who appear in the videos that were recorded are either members of the development team or people with connections to SCE. To give an example, the man saying, "Huh, looks like the boat's stopped..." in archive [No.047] Ferry Passenger's Video Tape is Director Toyama. Make sure you look at the analysis of the archive items and find out these little hidden details. Creating archive items for the game is actually quite a laborious job. Though it may simply look like a photo, that doesn't mean they just took a picture and were done. Take, for example, archive [No.069] Photo of Soji Abe and Ryuko Tagawa. In order to make sure they could change it to fit with Abe's ending, which causes the collapse of cause and effect, they photographed Abe and Ryuko separately, then combining the data to make it look like they took it together.